It was a good year for Seamus Coleman and James McCarthy but Sean St Ledger will want to forget the last twelve months. 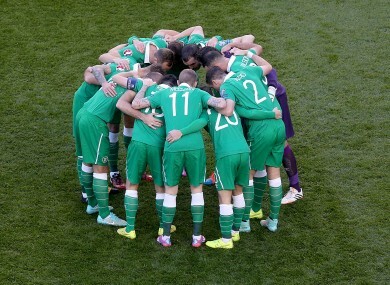 Martin O'Neill's side played 11 games in 2014, winning three. AS FAR AS making an evaluation of Ireland’s year is concerned, it’s difficult to determine whether 2014 can be deemed as a collective step in the right direction just yet. As much as the next few months will be a defining one for the Martin O’Neill, it will be equally significant for the players. Some have shone over the last twelve months whilst others have gone backwards in a green shirt. Here, TheScore.ie looks at five Boys in Green who flourished in 2014 and five others who will be glad to see the back of it. It’s always easier to dissect the positive aspects. With last month’s underwhelming defeat in Glasgow still fresh in the memory, it would be easy to have a blinkered outlook but there were plenty of positives for O’Neill to take from 2014. Not least the continued form and progress of Everton duo Seamus Coleman and James McCarthy. The former had another stellar year at club level and while some will argue he has yet to reach those heights on the international stage, Coleman has quickly developed into a vital component of the Irish set-up. The right-back’s repute continues to spiral – he was named in the PFA Team of the Year – and is one of the few in the current squad to enjoy regular Premier League football. Coleman played half of Ireland’s outings in 2014 but it was when he was absent his true value to the side was underlined. McCarthy enjoyed similar success in 2014. The former Wigan man continues to excel under Roberto Martinez and has developed into the fulcrum of Ireland’s midfield. While his role for club and country invariably differs, the 24-year-old brings an element of composure – particularly in possession – to the Irish engine room. That said, 2015 is a big year for McCarthy in a green jersey. The Irish management will be hoping to nail down a settled midfield partnership and Jeff Henrick has shown he’s more than capable to slot in alongside McCarthy. The Dubliner featured seven times for the Boys in Green over the last twelve months and showed glimpses of the sort of form which has seen him become a regular under Steve McClaren at Derby. The Play-off final defeat was obviously a huge disappointment for him and Derby’s band of Irish players but he will have learnt from the experience and perhaps another year in the Championship will serve him good. Already he’s scored five goals this term from midfield with the Rams flying high once more. O’Neill showed a great deal of faith in Hendrick for the game at Celtic Park and while he became lost in the occasion, the same could be said about many of his senior team mates. Given he’s only 22 and still relatively inexperienced at the highest level, he has come a long way in a relatively short period of time. John O’Shea’s goal in Gelsenkirchen was undoubtedly the stand out moment of 2014 and Hendrick’s role in the last gasp equaliser as well as his overall impact off the bench only highlighted his potential. It was a breakthrough year for him. At the other end of the career spectrum is Robbie Keane. On the face of it, the Irish skipper had a relatively quiet year on the international stage with the hat-trick against Gibraltar his only strikes in seven appearances. However, Keane’s enduring worth was underlined further over the past twelve months. Some will argue much of that was down to the barren form of Shane Long and the lack of obvious candidates to share the goalscoring load but his prolific season with LA Galaxy would suggest that Keane, as the shadows begin to lengthen on his career, is still worth his place more than ever. Anyone who tuned into the MLS Cup final earlier this month would have seen him struggle to stamp his mark on proceedings until deep into extra-time when he clinically struck the winner. There are very few marksmen who have the proficiency to pop up at the right place, in the right time after playing in the shadows for much of the game – Keane will always possess that. Given Ireland’s style of play, they invariably are happy to sit in a rigid formation and hit teams on the counter-attack. While Long may offer the perfect spearhead – using his pace to run in behind and stretch defences, Keane is the perfect ally. The option of utilising the pair in tandem should be seriously considered when hositiltes resume in March. What’s more, his treble against the Group D minnows moved the 34-year-old to 65 international goals and joint 13th in the all-time goal scoring charts. He also scooped the MLS MVP award and a third title. Not a bad year’s work, all told. It’s four years since Cillian Sheridan made his international debut and while he may not add to his handful of caps, the Apoel striker is making waves in Cyprus. After struggling to fulfil the considerable potential he showed at Celtic, Sheridan was released by CSKA Sofia two years ago but has flourished in 2014. While his goals domestically will be taken with a pinch of salt, his three strikes in the Champions League Qualifying stages helped Apoel qualify for the group phase for just the second time. Six years after making his debut in the competition for Celtic, Sheridan was back in the big time as he featured in all six of Apoel’s group fixtures. Ultimately, their campaign ended in disappointment as they missed out on finishing third and earning an Europa League berth but Sheridan has already found the net three times in the opening twelve games of the Cypriot league as Apoel lead the way, once more. It appears Sheridan isn’t on Martin O’Neill’s radar, just yet anyway, but as the only Irishman to be involved in this season’s Champions League, perhaps the manager should be making a trip to Nicosia to have a closer look at the 25-year-old. You can only feel for Gibson. The midfielder missed almost all of the 2013/14 season with a cruciate injury and his recovery progress continues to be hindered by a litany of knocks and niggles. That said, he returned to fitness for the final three qualifiers of the year before picking up another knee injury during the game at Celtic Park – he hasn’t played since. While his steely performances have been encouraging, it’s been another frustrating year for a player, who has the qualities to be a consistent performer in the heart of the Irish midfield. Frustratingly, it’s been a year which has seen Gibson take one step forward, and then two steps backwards. After returning to the international fold after his self-imposed exile during Trapattoni’s tenure, Gibson’s lack of match fitness continues to prevent him forming a settled partnership in midfield with McCarthy or Glenn Whelan. What’s more, having worked his way into the Everton side, his lengthy lay-off has meant he has fallen behind Gareth Barry, Ross Barkley and McCarthy in the pecking order. His game time at Goodison Park has been extremely limited, making it difficult for him to attune to the demands and pace of international football when sprung into action in a green shirt. It’s been a mixed year for Shane Long. A £12 million transfer to Southampton was seen by many as a good career move from a perennially relegation embattled Hull. However, the hefty price tag has weighed heavy on his shoulders at St. Mary’s and his international form has left a lot to be desired. With Robbie Keane absent for several of Ireland’s early-season friendlies for one reason or another, Long was given the opening to prove he is a capable replacement for the Irish skipper. A return of one goal from nine appearances doesn’t inspire much confidence, however. True, Long has never been a clinical marksmen and he is a vastly different operator to Keane but the succession of guilt-edged chances he squandered, particularly in the summer friendlies, is disconcerting for a player of his talent. Of course, his overall impact extends beyond sticking the ball in the back of the net and Ronald Koeman has often deployed the 27-year-old out wide in the Premier League but his barren run for the Saints – he’s scored just three goals since joining – will do little to infuse him with the confidence a goalscorer needs. He’s been in good recent form for Aston Villa having broken back into Paul Lambert’s plans but Ciaran Clark has yet to really establish himself within the Irish set-up, although he did feature in the final outing of the year against USA. Other than that appearance, he played just one other game for the Boys in Green in 2014 having fallen behind both Richard Keogh and Alex Pearce in the pecking order. After making his Ireland debut in 2011, it had seemed Clark would kick-on after a run of games in the side last year but his decision making can often let him down and the 25-year-old is prone to an error, or two. That said, time is still on his side and with John O’Shea reaching the twilight of his international career, there may still be an opening for Clark to become a regular under O’Neill and beyond. 2014 wasn’t the year he made that breakthrough, however. His year may be finishing on a high but a brief loan stint with Ipswich Town won’t mask what has been a nightmare twelve months for Sean St Ledger. For a player who, only two years ago, was at the heart of the Irish defence at Euro 2012 and having just secured a move to Leicester, things have gone downhill fast. When he was deemed surplus to requirements by Leicester in May, a period in the wilderness followed as he failed to find a new employer. Remarkably, St Ledger didn’t make one senior appearance in 2014 and last played for Ireland in over two years. It’s been a sad turn of events for a defender who made great impressions under Giovanni Trapattoni. Ahead of the Euro 2016 Qualifier against Georgia, the FAI asked fans to send a picture of where they were watching from: St Ledger tweeted a snap of him in a bar in Athens. St Ledger has been through the mire over the last year and while his opening with Ipswich offers a beacon of hope, his career has been on a downward spiral, one which is very difficult to arrest. Kevin Doyle hasn’t endured such a turbulent twelve months as former team mate St Ledger but he would give the defender a could run for his money in the pity stakes. Ever since Wolves’ relegation from the Premier League a couple of years ago, Doyle’s future has been far from certain but, somehow, he remains at Molineux. He worked his way back into the fold briefly last year but was soon shipped out on loan to QPR and while he did well during a brief spell at Loftus Road, nobody was interested in signing him during the summer. That left Doyle in limbo before Crystal Palace swooped late in the day to sign him on deadline day on a loan deal. He’s managed just three appearances for the Eagles – all as a substitute – and his arrival was met with disapproval from sections of the Palace support. It wasn’t all bad for Doyle this year. He managed to bring his international tally to 14 with a goal in the friendly win over Oman and also featured as a second-half substitute against Gibraltar. For a player who should be in his prime though, it’s hardly nothing to write home about. With his contract at Palace up in January, there will be more uncertainty over what’s next for Doyle. Until he settles down at a club and is getting regular game time, it’s difficult to see him having much impact for Ireland. Email “The good, the bad and the ugly - The Irish footballers who flourished in 2014 and those who didn't”. Feedback on “The good, the bad and the ugly - The Irish footballers who flourished in 2014 and those who didn't”.